In the ensuing chapters, we shall see the ability of this "devil' to awaken piety in people, to draw crowds, to make sinners change their way of life, to make the faithful renounce the world and devote themselves to a life of prayer, sacrifice and penance. This is an amazing phenomenon of most effective apostleship; one that has occurred at Lourdes, Fatima and Garabandal, etc. But Monroy now proves to us that this splendid apostolate is not the work of God, or of the Blessed Virgin, or of the Infant Jesus, or of St. Joseph, or, for that matter, of the angels, but of the devil . . . The work of a poor devil whose every effort seems doomed to dismal failure; because, if he does not watch his step and goes on working so craftily and successfully, at this rate it will not be long before he is shocked to find colossal multitudes, totally deceived, being utterly transformed by their faith as a result of his "false apparitions" and taking the path of repentance and salvation. Blessed be an "enemy" who works in such a fashion. 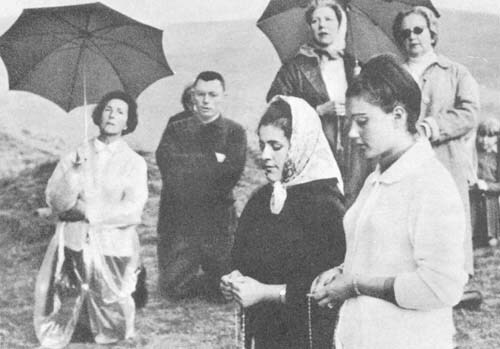 Loli and Conchita saying the rosary.